I have been carving since 1969. My sculptures have evolved from realistic to abstraction, with my philosophical focus and medium of expression remaining constant. In 2006 I was able to build a large studio behind my home. It is here that I strive to create forms that are visually beautiful and comfortable in the landscape, exhibiting strength along with the frailty that I see in existence. I use the natural and eternal presentation that stone affects to carve abstract forms that reflect our common humanity and express the wonder and beauty that is of our world. I flag each sculpture with ethereal colored glass that sparkles with light and throws reflections of color onto the surrounding surfaces of the sculpture. The stone and wood that I carve project a feeling of strength and stability, and the addition of glass (representing our passions and feelings) renders a vulnerable and fragile quality to my art. This quality of opposites, strength and fragility, is a reminder of the beautiful balancing act that is ever present in nature. 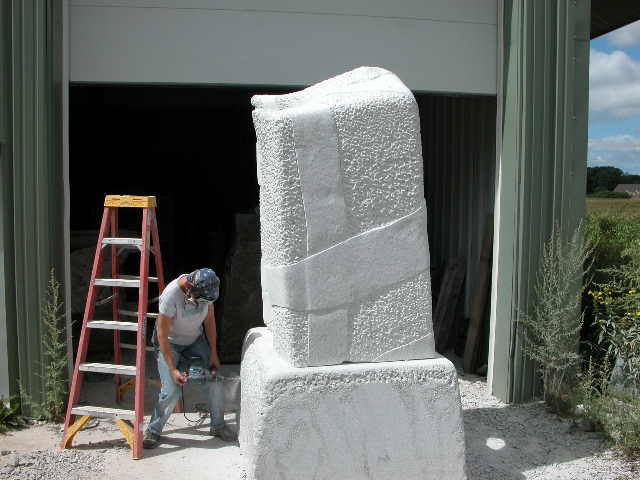 I use an electric angle grinder and an impact drill with diamond blades and bits, along with hand tools such as chisels and hammer and rasps to shape and finish each sculpture. The caste glass is broken into shape with a hammer and chisel.